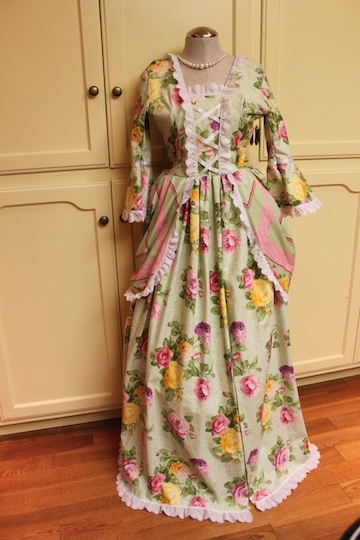 This southern bell dress was inspired by my youngest daughter, Sierra. 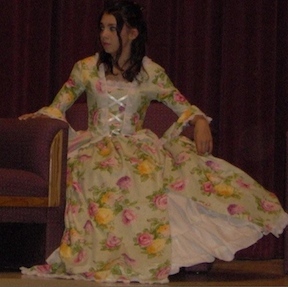 She was 13 (5 yrs ago)at the time, and needed a southern bell dress for her drama class. It was the final play of the school year, and she had 102 pages to memorize (with southern accent). While she studied her lines nearby, I worked on the dress. She made all the decisions regarding design, pattern and fabric, and I went with the flow. It was a lot of fun. When we got to the finishing touches, I started to lack some confidence in the finish work, but my sweet daughter said "mom don't worry, it looks great, and it's going to be fine". Kinda funny hearing those words from her to me, instead of the other way around, but I never forgot it. We picked out the pattern together, and she customized it. 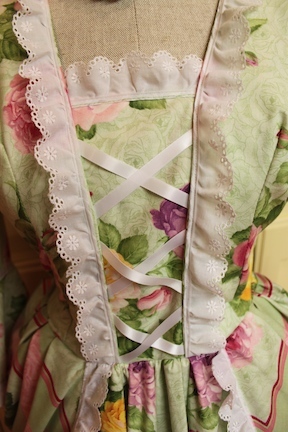 We made it long, added white ruffled trim, and a few other details. She was very patient with the fittings, and very opinionated about how it was going to look. I trusted her decisions and followed her lead.It was hard for us both to see a southern bell dress coming out of this pattern photo, but with the big flowery fabric, it was working. 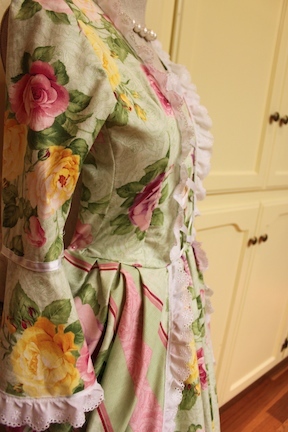 My daughter would normally never go for green fabric with with big gaudy flowers, but she actually was very much in favor of this fabric, because it was the closest thing to what we needed for the southern bell dress. I wasn't so sure she could bring herself to go against her natural teen instincts, but she came through and put the play and the dress above her own tastes. Later we borrowed a hoop skirt to slip under the dress, but because we didn't add it til later, it didn't fit. The quick fix was to take out a couple of seems and allow the white hoop skirt underneath to be seen a bit. When she walked out on the stage, I heard gasps and comments from the audience. They were commenting on the beautiful dress. Most the kids were wearing something out of the school drama closet, so things don't always fit the part or the actor. Sierra's dress fit her like a glove, and was loud and perfect for her roll. She not only looked amazing, but never missed a line or a word of her part. She even helped others on stage with their lines. 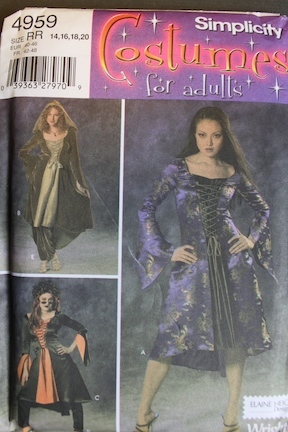 It seems obvious now, but I should have had the under garments, like the hoop skirt slip before starting the dress. Then I could have purchased enough fabric to go around the hoop. On the other hand you don't sew a southern bell dress everyday, so thinking about a huge hoop wasn't on my mind at the time. Also this was a drama project, not a wedding, so keeping cost down was important. It was a great experience working with my daughter on this dress. We worked well together, and have fond memories of the experience of designing and sewing a dress together.